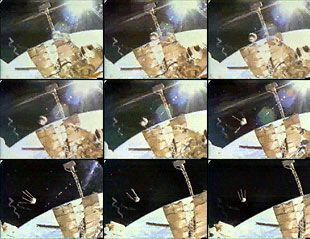 A cosmonaut tosses a miniature Sputnik satellite into orbit during a spacewalk outside the Russian Mir Space Station in this time-lapse series of video images. Fiftyyears ago today, the world changed forever. What began as a science experiment,quickly evolved into a political competition, and then drove humankind as faras the Moon in less than 12 years. Of course today, 50 yearson, it seems so simple. Several thousands of satellites later, when a privatecompany can launch a satellite into space, to say nothing of the 463 people whohave been there and back, a 23-inch, 184-pound beeping ball could almost beoverlooked. Almost. TheEarth's first man-made moon remained in orbit for only 57 days but itsinfluence can still be felt 50 years later. The U.S. civilian space agency,NASA, can credit its founding, three days shy of one year later, to thepolitical reaction to Sputnik 1. Sputnik's now familiar "be-beep, be-beep,be-beep" was the original satellite radio. And the race heralded by thosebeeps ultimately led to the cooperation experienced today on the InternationalSpace Station. Sputnik1 was completely destroyed when it reentered the atmosphere on January 4, 1958.What remains today are the handful of backup units, vintage and modernreplicas, and less tangible reminders of the now iconic quad-spiked sphere. As atribute to the five decades of space exploration that it set into motion,collectSPACE.com presents a countdown of the top ten Sputniks. Visit collectSPACE.com to readthe entries in order or click on the following links to jump ahead in the countdown. Whereelse would you expect to find the world's most popular Sputnik than the world'smost popular museum? The Smithsonian's National Air and Space Museum inWashington, D.C., displaysa full-size Sputnik hanging in its Milestones of Flight Gallery near otherhistoric spacecraft. It wascataloged as lot 241, titled simply as "Sputnik". Offered for auctionon May 9, 2001 by Christie's in New York, the nearly two-foot diameter silversphere with its four extending antennae stood out from the sale's otherartifacts, not just for its history but its size. It fetched $160,000 by theauction's close. Thoughthe occasional authentic Sputnik has been sold, the six-figure sale price has keptmost of us Sputnik-less. Fortunately, there are numerous smaller Sputniks ?both in physical size and price tag ? that means just about anyone can add alittle Sputnik to their personal space. On March2, 1962, just 10 days after making history as the first American in orbit, JohnGlenn visited the United Nations in New York to attend a reception in his honorand to address delegates from the then-newly formed Committee on Peaceful Usesof Outer Space. According to the New York Times from that day, as hewas leaving, Glenn paused to point out to his wife Annie and their family amodel of Sputnik, hanging in the public lobby. A man is seen running downa Washington, D.C. hallway. Reaching a conference room, he excitedly burstsopen the door. "It's called Sputnik!" he exclaims in the cinematicversion of Tom Wolfe's "The Right Stuff." ThoughSputnik 1 fell out of orbit long ago, its familiar silver sphere and fourantennae can still be seen around the globe. By some counts, there are nearlyas many Sputnik replicas on display in museums today as there have been yearssince the original satellite was launched. Oneday shy of a month after Sputnik 1 made history as the world's first man-madesatellite, the Soviet Union launched Sputnik 2. This time, in addition to radiotransmitters like that of its predecessor, the satellite carried the firstanimal into orbit, a dog named Laika. This is not the story of Sputnik 2, butof asecond Sputnik launched 40 years to the day Laika left Earth. LordBritish owns a real Sputnik. The ruler of Britannia, the fictional kingdom inthe Ultima series of computer games, is the alter ego of RichardGarriott, the game's successful developer. Garriott, in real life, lives inBrittania Manor, his custom designed 'castle' in Austin, Texas, which, as onemight expect, is adorned by the eclectic, from suits of armor to dinosaurfossils to the real Soviet satellite. So where does one go tosee how Sputnik worked? Why Russia, of course. But not just anywhere in Russia;to find the next best Sputnik to the real thing, you need to visit the museumat the S.P. Korolev Rocket and Space Corporation Energia outside of Moscow. #1. TheSputnik That Started It All?????? The Simplest Satellite,PS-1, Sputnik-1, Prostreishiy Sputnik: whatever name you assign it, ?it?started the space age. Silver in color and about the size of a beach ball,Sputnik orbited the Earth for almost two months. But does anything survive ofthe world?s first satellite today?